Only these models W11BM10V101H, W11WT61V202, W11BC71D712, W11VM11W102, W11WT13H267, W11BM51W101, W11VC62V507, W11WM14V114, W11WT13V114 can ship out within 7 business days. All other models will ship within 3-4 weeks. Cancellation Fee: Customers have 72 hours to cancel an order after the ship date has been given. There will be a 10% fee applied if the order is cancelled after the given time frame. Diffrient World marks Humanscale's first foray into all-mesh task seating. Like its mesh-backed forerunner, Liberty, the Diffrient World chair's tri-panel backrest hugs the body to provide tailor-made lumbar support, while its mesh seat eliminates contact stress under the thighs. But Diffrient World’s major innovation is its mechanism-free recline action, which leverages two parts of the chair’s frame and the laws of physics to provide automatic, balanced support throughout the full range of recline. No chair is more intuitive, creating the ultimate user-friendly sitting experience. Humanscale is obsessed with simplicity - making products that are incredibly easy to use with the fewest parts and controls possible - while at the same time offering the highest levels of performance and functionality. That obsession, along with the goal of making a high performance work chair accessible to more people, is what led to the development of the Diffrient World Chair. The latest from design legend Niels Diffrient, the Diffrient Work Chair features an unprecedented combination of performance, sustainability and simplicity in a task seating solution. The Diffrient World Chair has just two manual settings - one each for seat height and e seat depth. All other fitting and adjustments are automatic. With its weight sensitive recline, the Diffrient World Chair automatically supports every user at every recline position. And its Form-Sending Mesh Technology provides tailor amde lumber support without external devices or manual controls. That means we have replaced knobs, levers and instructions with effortless ergonomic comfort. In stark contrast to other task chairs - with so many controls and adjustments that they require hands-on training - the Diffrient World chair’s simplicity means that users can take full advantage of its ergonomic benefits the moment they sit down, without even thinking about it. So instead of managing chair training for today's and tomorrow's employees, organization can focus on managing their business. And with just eight major parts only 80 overall - very little can go wrong with the Diffrient World chair over time. That’s why it comes with an industry-best 15-year 24/7 warranty. In other words, the chair’s simplicity reduces the need for ongoing maintenance and repairs, making it even easier for an organization to own. Weighing just 25 pounds and made of one-third the parts of traditional task chairs, the Diffrient World chair requires far less raw material and fewer manufacturing processes and that means less extraction, energy, waste, shipping and disposal associated with its lifecycle. 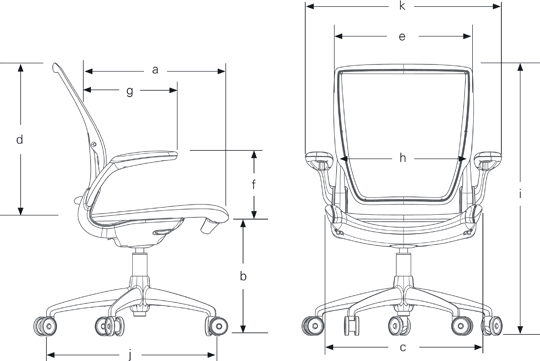 In fact, the environmental impact of the Diffrient World Chair is roughly half that of an average task chair. Plus, its modular design further boosts its already-long serviceable life with easy in-field upgrades and part replacements. By the way, it's 97% recyclable too. Optional upholstered polyurethane foam seat cushion. Injection-molded, structural, integral color glass-filled Nylon 6. Pneumatic cylinder for adjustable seat height. Mechanism-free counter-balance recline action automatically provides the right amount of support through the full range of recline motion, regardless of user size and weight. Provides additional lumbar support as needed. Tri-panel, non-stretch mesh construction creates body-fitting contours and self-adjusting lumbar support for a customized fit. No external lumbar devices to adjust, break or lose. Modular for easy replacement and upgrades. Automatically sculpts to match body contours. Cradles the body in flexible, breathable mesh. Frameless front edge eliminates contact stress under the thighs. Provides seat height range that accommodates 95% of the population. Size adjustable to fit 95% of the population. Form-sensing mesh provides perfect lumbar support automatically. Seat Height: 5” (127 mm) adjustment range. Seat Depth: 3.5” (89 mm) adjustment range. 3” (76mm) standard hard casters. Height-adjustable armrests with 3.2” (81mm) range of adjustment. Mesh topped with a thin layer of polyurethane foam. Upholstered in a variety of textile options. Low cylinder for small users. Tall cylinder for very tall users. High cylinder with foot ring. Non-rolling glides for fixed location use. Optional soft casters for hard floors. Standard chair fits more than 95% of the office population. 5’0” Woman to 6'4' Man. 27 lbs. (12.2kg) Conference Chair/Task Chair. 25 lbs. (11.3kg) Armless Chair. 22° recline plus 7° backrest tilt. The Diffrient World chair is a great example of Humanscale's environmental purpose. Made predominantly of glass-filled Nylon 6. Contains 34% recycled content (10% post-consumer, 24% pre-consumer). Weighs only 25 lbs. (the lightest chair in its class). Made of only 8 major components and 80 total parts. Modular parts for easy upgrades and replacements. Ships in 85% recycled packaging, or blanket-wrapped when feasible. 15-year 24/7 warranty for long life of service. 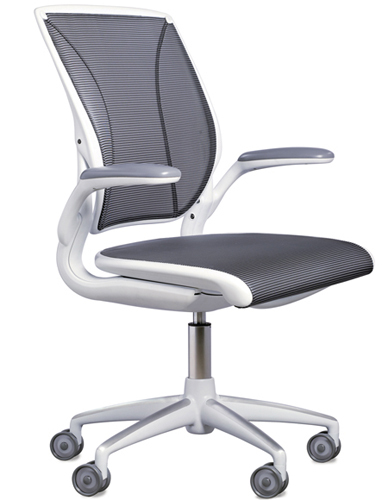 The Diffrient World chair can help building projects achieve valuable LEED credits. Resource Reuse, 30% Furniture & Furnishings. This award-winning mesh textile was designed to provide optimal ergonomic support and comfort by melding strength, flexibility and resiliency. Using only monofilament yarns that are thin and strong, a simple but classic stripe pattern is achieved through weave structure and yarn placement. This pattern has slight elasticity, but terrific memory. This brilliant weave of monofilament strands and silver-coated yarns offers resiliency and durability. The award-winning mesh textile was designed to provide optimal ergonomic support and comfort by melding strength and flexibility. Like Humanscale's other meshes, Silver Check has a low abrasion factor and is extremely gentle on clothing. A high-performance weave of nylon, polyester and urethane yarns, Torque was originally developed as a protective layer for motorcycle riders. Providing optimal ergonomic support and comfort by offering remarkable strength, flexibility and resiliency, Torque also has a low abrasion factor and is extremely gentle on clothing. The cushions on all Humanscale chairs utilize advanced technology developed primarily for the sportswear and sporting goods industries. In a single step, a high-tech molding process combines the textile, foam or Technogel and plastic support shell into a single, modular unit which can be attached to our seating with four screws. Because of this advanced process, the textiles used on the cushions are as unique as the rest of the chair, and satisfy requirements more demanding than typical upholstery textiles. Developed initially for sportswear, Wave responds to the unique form and production requirements of Humanscale seating. This four-way stretch fabric exceeds all contract interior testing requirements for heavy-duty upholstery. The colors of Wave are taken from the phenomenal hues found in nature. For liquid-based stains that penetrate the textile, remove the stain as quickly as possible to minimize the likelihood of permanent staining. For more substance-based stains that sit on top of the fabric, scrape off the excess substance with a knife or coin immediately. Always use water-soluble solvents such as dishwashing detergents to clean. Vacuum the textile on a weekly basis to extend the life of the material and to help identify any stains that must be removed. Constructed of a simple weave using a blend of nylon, Cordura and elastic yarn, this textile offers a pleasing texture and extreme durability. Because of the Cordura content, this fourway stretch woven textile performs to the rigors of the most demanding environments. The color palette includes brights, classics, and neutrals. Aptly named after the plant known for its healing properties, beauty, and cleanliness, Lotus is one of the latest creations from award-winning designer Elizabeth Whelan. Water repellant and easy to clean, it is an ideal textile for the healthcare and hospitality environments. Its polyurethane finish with nylon backing boasts a soft texture that is pleasant to the touch while offering exceptional durability, and its four-way stretch design provides the flexibility to seamlessly adapt to Humanscale’s unique ergonomically designed seat cushions. Lotus meets and exceeds all performance requirements for task seating applications, including all heavy-duty contract and healthcare tests. Lotus is Electrostatic Discharge (ESD) compliant and meets ANSI/ESD-STM-12.1-2006 requirements. Contact your Humanscale representative for more information. Created by Elizabeth Whelan Design, Ginkgo reflects the delicate parallel veins of the Ginkgo biloba tree leaves. It is composed of 90% wool, a renewable fiber that offers durability, elegance and flexibility. Available in a variety of vibrant and saturated colors, Ginkgo extends the breadth of Humanscale's seating color line. Ginkgo's exceptional performance on contract textile tests and subtle sophistication will satisfy any task seating application. Offering style and performance, sensuede was developed to be the best and most luxurious engineered suede available. The silky feel is the result of recycled microfibers that are breathable, extra-strong, and resistant to most stains and wrinkles. For liquid-based stains that penetrate the textile, blot to remove excess liquid and remove the stain with a cloth soaked in warm, sudsy water. Use a dry cloth to absorb excess water. For more substance-based stains that sit on top of the fabric, scrape off the excess substance with a knife or coin immediately and remove with damp cloth.To restore Sensuede's natural sheen and luster, brush the fabric when dry with a suede brush. I purchased two of these chairs for our Division Head at Wheeling High School and for one of our ESL teachers. Because it's summer, only the Division Head has tried the chair, and she has praised the chair. It's comfortable, it's easily adjustable, and moves with you. I feel confident that our ESL teacher will also love the chair! 0 of 1 voted this review as helpful Was this review helpful to you?